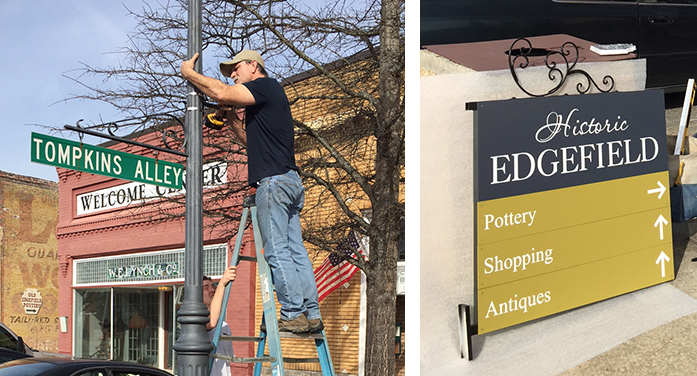 The town of Edgefield is getting new signs thanks to an $80,000 grant from the SC Heritage Corridor. Crews began placing the new signs in and around the town, Tuesday morning, Jan. 17. According to Town Administrator Roger LeDuc, who spoke to the Advertiser regarding the matter, signs being erected will include those such as pedestrian signs, vehicle and parking signs, trail markers, and a welcome sign. Each sign will be color-coded and will correspond with maps that are being placed at four locations throughout the town; in front of the distillery, at the welcome center, at the corner of Lynch and Main Streets, and in front of First Citizens Bank. Event signs will also be located at all the aforementioned locations except in front of the bank. A total of 34 signs will be placed in Edgefield; 24 in the downtown area and 10 outside of it. One Response to "New Signs for Town of Edgefield"